There is dedication, motivation, inspiration and commitment in the things we love to do. Let’s face it, most of us are doing things to better ourselves whether health, fitness employment or just self care. As a runner nothing feels more rewarding than having these things in the forefront running in a community of numerous accountability partners. If you have a goal staying focused and committed to the goal yes we all fall short in our journey and we have runfessions to share with one another but often those runfessions remind us where we started and how far we have come. Just like taking a deep cleansing breathe we continue to move forward in our passionate journey of fitness. This next story is no coincidence. It has been rewarding to witness first hand the journey of Carin maximizing her potential in her fitness journey. I can recall when Carin first joined Black Girls Run several years ago. 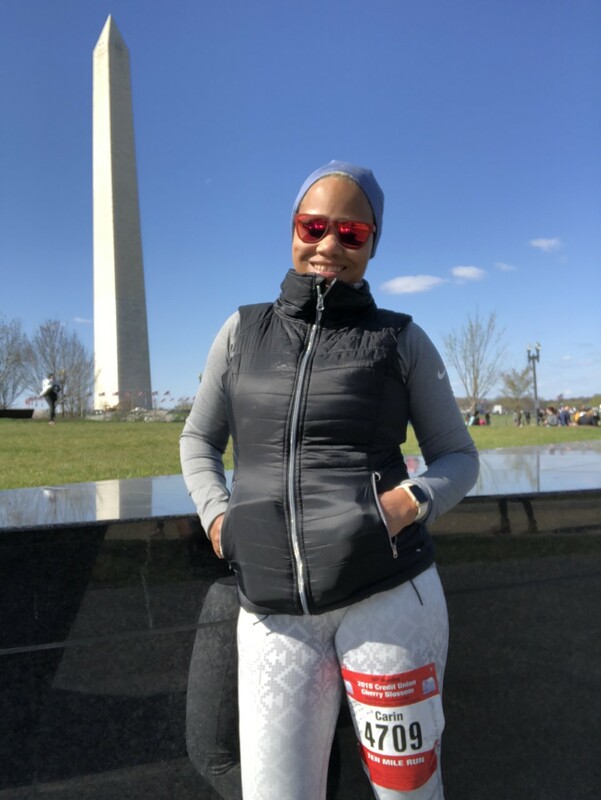 We had a small conversation on the Capital Crescent Trail about her goals and fitness journey. At that time Carin was jogging/walking but she kept consistent by continuing to come out to the weekly runs. Over time she began to build her mileage and thereafter she was training for her first race, The Biggest Loser 5k. Then she did the Nike Women’s Half Marathon and then the Frederick Half Marathon. Those were just for starters. Read her story and you can see how she maximized her fitness. Lastly, who doesn’t like the sensation of your feet hitting the pavement one step at a time either by walking, running, wogging or jogging? It is all a forward motion to fitness. Everybody deserves a place on the pavement. Hi everyone, my name is Carin and I am a runner. I never realized this when I started my running journey, but the minute you hit the pavement and you start running you are a runner. Runners come in all shapes, sizes and speeds. So whether you run walk, jog, walk, wog you are a RUNNER. I am here to tell you how I started and became in love with the running community. My running journey, I mean walking journey started in May, 2013. I saw my friend post on Facebook that she walked with Black Girls Run in Germantown, Md. and she was so inspired to go back again. 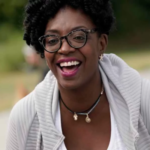 I immediately reached out to her to get the information, it was like divine timing since I was on the Black Girls Run DC page a couple of weeks prior checking out all of the of posts and never thought to look for a run local to my area. I went to my first run on May 25, 2013 – I can’t believe I remember the date and I’m not going to lie I was a little nervous, my friend wasn’t able to attend and I was afraid I would be the only walker. I showed up bright and early and before me stood all these women discussing what distance they were gong to run. Of course, I started to sweat just a little bit because I didn’t want to walk alone. Before we started, everyone went around and introduced themselves and stated how many miles they were doing. It was my turn, I introduced myself and said I am only a walker. To my surprise, four of the ladies said great you can walk with us. We all separated and started our route, the ladies were all so welcoming and really encouraging. I felt so welcome and inspired to come back again. 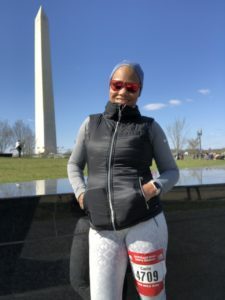 Fast forward to about a month of walking and the group met at a different location — The Capital Crescent Trail — this is where you see a sea of runners, bikers, and walkers. We all mustered and talked about distance, my trusty group of ladies that I walked with weren’t there. I was nervous to run, but felt confident that the ladies who I ran with would not leave me behind. We ran, I ran I couldn’t believe it, I ran and week after week I ran farther and farther. Fast forward, I have run many half marathons, 10ks, 5ks and most recently completed three full marathons over the course of two years. The journey to get me to run a full marathon is a funny one, but I will save that for another post. All I can say if when you have friends who are super runners, they will push you to go beyond your comfort zone. Just believe that if I could do it, you can too. 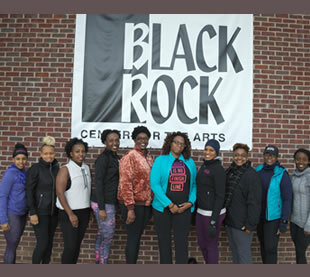 I am forever thankful for the Black Girls Run Germantown group, I have met some of my closest friends and I now take my health and wellness so much more serious. I am in the gym or outside working out 3-4 days a week, I have changed my eating habits, I run several times a week and encourage women to just move and remember walking is movement, that’s how I got started.